Eve is an exemplary all star for her peers. 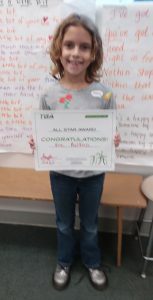 Her perfect attendance, eagerness to learn and play tennis, and acts of sportsmanship during her tennis enrichment class in Santa Monica is why she is our January All Star. Congratulations, Eve and we hope to see you continue playing tennis!